I bought "Smead" Brights Folders- 1/3-cut tabs- Letter Size- Assorted Colors-QTY 100. The folders come in 5 different colors- Yellow, Red, Blue Green and Orange. You can purchase the colored folders at www.Smead.com. A hole punch was used on the folders so they could go in a large white binder folder.We will be making several different Bible story lapbooks so they can fill their binder up. The first picture on the left at the top you see if the front of the lapbook. 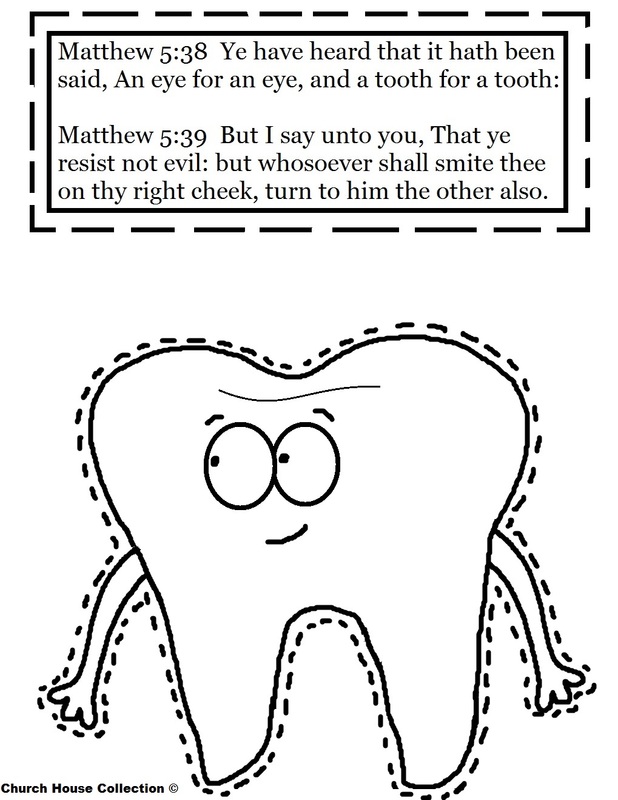 This is a tooth picture that I drew and I added the scripture from Matthew 5:38-39 to the front. I just taped it down. When you open the folder on the left hand side there is a picture of another small tooth and some words that I cut out using decorative cutting scissors. The scripture is about when Jesus said that of old times it was said, "An eye for an eye and a tooth a tooth, but resist not evil he said. He said to turn and give your other cheek if someone hits you. That is really hard to do, but if we heed to what God say's to do then we will be okay. If you don't brush your teeth what will happen? They will rot and fall out. Or you would have to get a filling or a cap. 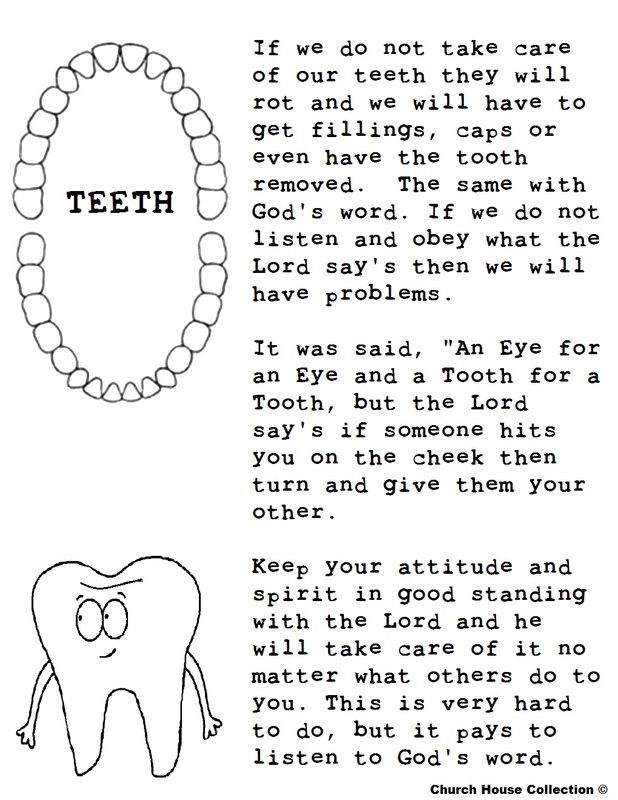 We have to take care of our teeth or we will have problems. The same with the word of God. If we do not obey God's word then we will have problems. It's not that God wants you to be a door mat and never speak up, but we have to learn to keep our Spirit in good standing. God said, VENGEANCE IS MINE, I REPAY SAY'S THE LORD. He will pour out vengeance on those who try to destroy or hurt you. You don't have to worry about trying to do something yourself when God can do it for you. God needs strong leaders. Jesus was meek, but a strong leader and speaker. He held is tongue at times, but at other times he spoke with strength and power and said in Matthew 23:29 Woe unto you, scribes and Pharisees, hypocrites! because ye build the tombs of the prophets, and garnish the sepulchres of the righteous and in Matthew 23:33 Ye serpents, ye generation of vipers, how can ye escape the damnation of hell? Jesus died for us yet he was not a doormat when he came to speaking the truth. We need to speak the truth of the word of God and not be a doormat for others to run over. Jesus spoke with power!!! He was not a doormat! He was the son of the living God. He is the GREAT I AM! He was not a push over! He was the CHRIST! We should hold our tongues when God say's to, and then when he say's to speak, then SPEAK! God can repay and finish things out for us and we don't have to even put our finger in it so to speak. Let God deal with your problem. When he handles it, it's done the right way. If we handle it, it could lead to destruction and more problems. God's way is the perfect way. Cut the small tooth and words out and tape to the inside of the left folder. The Teeth picture goes on the right side of the folder with the toothbrush and mouth with marshmallows. This sheet is for the front of the folder. Just cut out and tape the words at the top and the tooth underneath it.